Charter Yachts Australia offer a modern fleet of skipper yourself bareboat charter vessels from Abell Point Marina, Airlie Beach with delivery options also available from Hamilton Island. Explore the Whitsunday Islands and Great Barrier Reef from the comfort of your own boat. No license is required, just basic boat handling experience or a willingness to learn. Their team of bareboat specialists will be on hand to guide you through the selection of their 20 and more fleet of yachts, sailing and power catamarans ranging from 32 to 46 feet. All vessels come with a fully equipped galley/kitchen, linen and towels, VHS Radio, safety equipment and six to eight person dinghy/tender. With options for all budgets, boating abilities and up to 10 crew, experience the Whitsundays at your own pace and create your own adventure. Sail, snorkel, dive, kayak, hike or simply relax at iconic locations like Whitehaven Beach…the choice is yours when you hire a boat with Charter Yachts Australia. 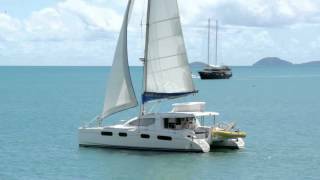 Charter Yachts Australia Sailing Catamaran 35 Seawind 1000XL "Paso Doble"
Their Seawind 1000XL “Paso Doble” is the perfect Bareboat Sailing Catamaran to cruise the Whitsundays. A well designed 10 metre performance sailing catamaran with unique design and modern lines. Features an upgraded sail plan which makes this vessel stand out with an extended waterline providing superior performance and sea handling. All controls lead back to the cockpit and to make things even easier there is a self-tacking jib and single line reefing. The Seawind 1000XL has 2 double berths, 2 singles and the cockpit table drops to become another double. Easy access on and off the boat for diving and snorkelling due to the extended transoms. With ease of handling and loads of deck space this vessel is great for both couples groups of 6 to 8. 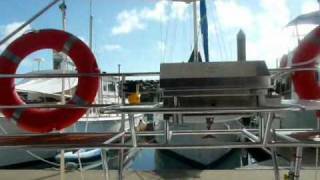 Seawind 1000XL Bareboat Sailing Catamaran – sailing in the Whitsundays on a bareboat charter catamaran. Charter Yachts Australia Sailing Catamaran Lightwave 38 "Mischief"
Lightwave Yachts have given their most popular model, the Lightwave 38, a new look with a new range of options. Showcasing Lightwave Yachts’ strength of innovative design, the Lightwave 38 FORTE provides more space, comfort and performance, whilst enhancing overall appeal. This beautiful sailing catamaran exudes modern design with sleek lines. This state of the art vessel has two private queen size cabins, one with ensuite and one double cabin. There is a full sized bathroom with an enclosed shower stall, toilet and vanity. This vessel has ample storage and features a popular galley up facility which is great for entertaining. The spacious cockpit has ample seating and cockpit table, with a large fridge below the raised helm seat for two. The walk around decks and spacious foredeck together with ease of handling make this an ideal holiday vessel. 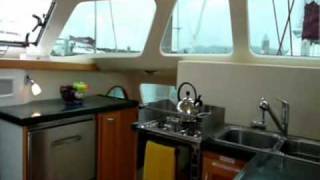 Charter Yachts Australia Sailing Catamaran Seawind 1160 "Yaminda"
Yaminda was launched in mid 2010. This catamaran’s innovative design is still winning awards which include the prestigious “Australian Sailboat of the Year” along with most recent as “Best Multihull” in the USA. Unique tri-fold doors stow securely into the cockpit targa roof creating a splendid indoor outdoor area. The luxurious saloon has full headroom, 360 degree visibility plus forward opening windows for exceptional airflow. The well planned galley has huge fridge, freezer, workbench and storage areas. There are 3 private cabins including two queen berths, one with a small child berth and one with an ensuite plus the saloon table which converts to a large double bed. The spacious main bathroom has a fully enclosed shower stall. With twin helm stations and a self-tacking headsail, this sleek, modern, performance catamaran practically sails itself. 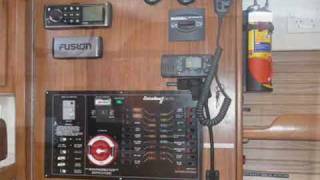 Their Seawind 1160 Bareboat Sailing Catamaran – sailing in the Whitsundays on a bareboat charter catamaran. Charter Yachts Australia Sailing Catamaran Leopard 38 "Alida"
Purpose built for charter and new to our fleet, this Leopard 38 accommodates up to 8 passengers. “Alida” features 4 double cabins and 2 bathrooms, with additional forepeak bunks perfect for small children or extra storage space. The spacious saloon has generous head room, an upstairs galley and front windows providing panoramic views, while the spacious cockpit is great for entertaining. The galley boasts ample refrigeration and storage, with easy access to the back deck. The exterior is charter-friendly, with the cockpit at deck level and built in table and seating, covered by a large hardtop roof that offers excellent protection from the sun or showers. Comfort and accessibility is a priority with this boat’s design allowing for plenty of space to spread out, relax and enjoy some first class sailing around the Whitsunday Islands. Charter Yachts Australia Sailing Catamaran Leopard 38 "Seafox"
Purpose built for charter and new to our fleet, this Leopard 38 accommodates up to 8 passengers. “Seafox” features 4 double cabins and 2 bathrooms, with additional forepeak bunks perfect for small children or extra storage space. The spacious saloon has generous head room, an upstairs galley and front windows providing panoramic views, while the spacious cockpit is great for entertaining. The galley boasts ample refrigeration and storage, with easy access to the back deck. The exterior is charter-friendly, with the cockpit at deck level and built in table and seating, covered by a large hardtop roof that offers excellent protection from the sun or showers. Charter Yachts Australia Sailing Catamaran Leopard 39 "Velella"
Cruise in style & luxury with the latest edition to the CYA fleet. Offering superior sailing performance expected from Leopard Catamarans, ‘Velella’ not only provides speed under sail, but comfort for you & your crew when you drop the anchor. Enjoy a functional saloon area featuring upstairs galley with plenty of storage for your provisions & table/seating for up to 8 adults. 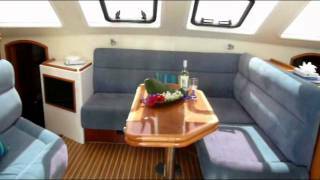 The saloon opens via sliding door to a spacious back deck with generous seating and additional exterior table and raised helm with seating for two for easy navigation. Below deck find 3 double cabins with 2 out of the 3 featuring their own TV for ultimate relaxation when the sun goes down. The Queen Master suite sits on the starboard side and includes a full bathroom with separate shower, office/navigation desk and plenty of storage for additional luggage and supplies. On the port side two double cabins sit forward and aft, with a bathroom positioned mid ship for easy access from either cabin or from up on deck. Additional features to this sailing catamaran include BOSE sound system, transom shower and deck barbecue. 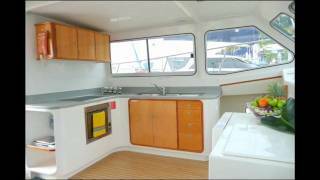 Charter Yachts Australia Sailing Catamaran Leopard 40 "Dolce Vita"
The deck layout of Dolce Vita is clear and uncluttered with the mainsail and jib controls all lead to the helm station for ease of handling. The vessel is also equipped with two inboard engines. Dolce Vita has 3 large private cabins and two bathrooms. The starboard side contains the master suite with queen size berth, ample storage, office/navigation area and full size bathroom with separate shower stall. There are two cabins on the port side with bathroom between. There is a large cockpit with outside dining area sheltered by a hard-top bimini. The large sliding glass door between the saloon and cockpit area provides easy access and an open flow between cockpit, saloon and galley area. This vessel is ideal, with comfortable living space for families and small groups of up to 6. Charter Yachts Australia Sailing Catamaran Seawind 1250 "Harley Girl"
This platinum edition sailing catamaran has many award-winning features including tri-fold doors, electric winch and twin steering station for optimised navigation, plus furling self-tacking headsail for ease of sailing with minimal crew. Perfect for families, couples and groups up to 6-7, this boat also features 2 x 29hp engines should crew wish to get around under motor without sailing. Taking space and comfort to another level with it’s front deck lounge area and on-shore air conditioning option, This sailing catamaran’s modern design has been completed with luxurious timber trim throughout and spacious saloon with daybed offering 360-degree visibility. Featuring 3 cabins and 2 bathrooms, the spacious ‘Captain’s’ quarters’ features a queen size island bed with private ensuite. Two generous double berths round out the sleeping quarters with a full-size bathroom on the port side. The spacious lower galley features a good-sized fridge and freezer, ample storage, double sinks and 3 burner cooktop with oven. Charter Yachts Australia Sailing Catamaran Seawind 1260 "Kajura"
The brand new Seawind 1260 sailing catamaran was purpose built with the Australian indoor/outdoor, open lifestyle entrenched in this new design, with an unbeatable living area complimented with brilliant natural ventilation. The protected cockpit lounge and social helm seats putting the skipper in control as well as in the conversation and boasts 360 degree views from the helm and saloon seats. The Seawind 1260 will sleep up to eight with three double cabins, two bathrooms and the saloon will accommodate another double. All cabins feature plenty of hatches for ventilation. The ample head room, the generous refrigeration space, and the roomy covered cockpit that fully opens into the saloon make for very comfortable cruising. For sailing performance; a full batten main. For easy sailing; all ropes are led to the cockpit. She has a roller furling self-tacking headsail, twin steering and an autopilot for the discerning sailors. Suitable for three couples, two families and mixed groups. She will also perform equally well under power. 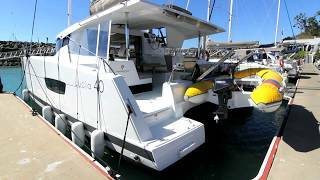 Charter Yachts Australia Sailing Catamaran Fountaine Pajot Lucia 40 "Mandala"
This exciting new 40-foot catamaran sailboat has been exclusively designed to deliver a simply superb experience at sea and while moored. Remarkable volumes and light-filled living spaces allow you to comfortably share the experiences and create life-long memories with family and friends. The Lucia 40 is a true revolution in her class. No other catamaran sailboat of her size has fabulous living space of the Lucia 40, which includes a luminous saloon, generous cabins, expansive 12m2 cockpit, and a decadent lounge area on the bow that spans more than 3m2! She is also the only 40-foot catamaran sailboat that includes four bathrooms and also boasts the largest Owner’s suite available in her class. Beautifully appointed, the Lucia 40 has all the contemporary conveniences you need for carefree cruising, so you can relax in comfort while experiencing the catamaran’s impressive performance at sea. 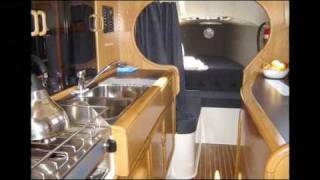 Charter Yachts Australia Sailing Catamaran Montebello 1250 "Karma Kat"
This spacious sailing catamaran has 4 queen size cabins, each with en-suite bathroom. The galley is situated upstairs in the saloon area and is fully equipped with a large fridge and freezer, a 2 burner stove top, and microwave. The saloon gives easy access to the cockpit. Charter Yachts Australia Sailing Catamaran Lightwave 45 "Reflections"
Built in Australia to suit their unique conditions, these huge catamaran features four double cabins and four bathrooms, with an additional berth in each of the forward cabins. The galley is upstairs next to the saloon with lots of fridge and bench space and leads directly to the entertaining area. The cockpit provides a large outdoor dining and lounging area and features the raised helm station, barbecue and easy access to the water or dinghy. Charter Yachts Australia Sailing Catamaran Leopard 46 "Two Keel A"
Performance, spacious accommodations and a focus on outdoor living are leading features of this new Leopard model, built by Robertson and Caine and designed by Morrelli and Melvin, architects of high performance cats. Built using the latest technology and materials, the Leopard 46 integrates an open-plan layout with exceptional interior volume, offering a comfortable cruising cat that combines excellent load carrying capacity with superior performance levels. Fully Air Conditioned and fitted with a 9KVA Generator to power the A/C while away from shore power. The Leopard 46 offers exceptional performance and speed on the water thanks to a powerful rig, stepped hull design and light displacement. A raised helm station is located in the hard top roof with open access to the cockpit and all controls lead aft for excellent visibility and resulting in a cat that is extremely easy to sail, even with a limited crew. The Leopard 46’s overall performance and ease of handling has earned it ‘Boat of the Year’ nominations from Cruising World magazine. Charter Yachts Australia Sailing Catamaran Fountaine Pajot 44 "Vela Perfecta"
Our new Fountaine Pajot “Vela Perfecta” – a 44′ Orana model – is the ideal vessel to sail around 74 Islands on your next Whitsunday bareboat charter. The helm station accommodates three people comfortably and affords excellent visibility above the deckhouse. The cockpit has plenty of room and connects to the saloon and galley via a large sliding door. The saloon table comfortably seats 8 and there is a 360⁰ panoramic view through the sliding door and bay windows. The 4 double cabins each have their own bathroom with separate shower. The starboard aft cabin has a “walk around” bed and the other three have semi-island configurations. Charter Yachts Australia Power Catamaran Scimitar 1010 "Mojo"
Cruise the Whitsundays on this comfortable power catamaran which includes two private double cabins and two single berths. In addition, the saloon table drops to make an extra double berth if required. 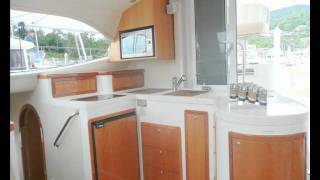 Very spacious saloon area and fully equipped galley. Full size bathroom with indoor/outdoor access. Flat screen TV with inbuilt DVD player. Charter Yachts Australia Power Catamaran Venturer 38 "Divocean"
Our Seawind Power Catamaran accommodates up to six adults in comfort or families up to eight with four private double cabins, two toilets & two showers. 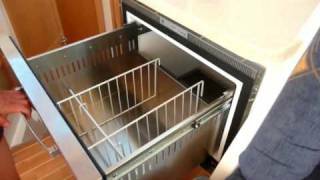 The well equipped galley has generous refrigeration & freezer space. The flybridge is great for entertaining. There is ample seating all around to enjoy uninterrupted views of the surrounds . This area is covered by a hardtop with wrap around clears for your comfort. The aft deck features a BBQ, esky and rod holders for the keen fisherman. Our Venturer 38 Bareboat Sailing Power Catamaran – cruising in the Whitsundays on a bareboat charter catamaran. Charter Yachts Australia Power Catamaran Fountaine Pajot 44 "Queen Marie"
Renown for their well-appointed luxury and state of the art equipment, this 44 foot Power Catamaran from Fountain Pajot is designed to provide superior comfort and space. Featuring 4 double ensuite cabins, with the two forward cabins offering an additional single berth. Guests will not only enjoy ample cabin space but three separate outside entertaining/relaxing areas, two helm stations (interior and exterior), generous galley and a saloon areas designed to cater for the large groups this vessel can accommodate. Additional features of this French built catamaran provide further comfort & convenience including Digital TV & stereo system, air conditioning, generator and a 240L galley fridge in addition to refrigerated deck eskies. 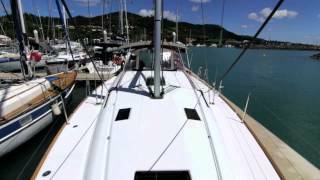 Charter Yachts Australia Catalina 320 "Beach House" and "Rock Star"
The Catalina 320 is perhaps the best small vessel available in the Whitsundays. Compact and easy to handle these boats provide space and comfort that is unprecedented. Excellent headroom and the largest fridges in the class Catalina 320 is ideal for one or two couples who don't need to spend a fortune for a larger boat. Charter Yachts Australia Jeanneau 36 "Jasambri II"
On the outside high performance hull, designed by Marc Lombard, the powerful sail plan, the deck designed for security, the generous cockpit with oversized, leather-wrapped steering wheel and deep storage lockers. Step below on the Jeanneau 36, and you will appreciate the space, natural lighting and comfortable atmosphere of a large sailboat. On the interior, thoughtful design and high-quality materials lend both tranquillity and warmth to this beautiful sailboat. Charter Yachts Australia Jeanneau Sun Odyssey 39i "Dream On"
This well presented 3-cabin yacht offers discreet luxury and space for three couples or a large family. Serving these spacious cabins are two bathrooms, a galley offering ample bench & storage space with generous refrigeration capacity, along with a central saloon dining area, navigation desk and option to convert dining table into an additional fourth bed. The spacious back deck is well designed with bimini & dodger for shade & comfort, central fold out table and the luxury of a hot water deck shower on the transom. For those wanting a pure sailing adventure, ‘Dream On’ has two 180w solar panels to charge the large house batteries on board, meaning engine use can be at a minimum should you wish to truly get back to nature while sailing the Whitsundays! Charter Yachts Australia Jeanneau Sun Odyssey 41 "Baronga"
Integrating all the latest improvements and key innovations of the Sun Odyssey line, this 41 foot sailboat is fast and easy to manoeuvre. Featuring 3 double cabins and 2 bathrooms, the spacious saloon includes a drop down table converted to a fourth bed. Up on deck enjoy twin helms, seating for 6 comfortably, dodger & bimini for weather protection and a stern duck board to enjoy easy access for swimming from the boat. Charter Yachts Australia Jeanneau Sun Odyssey 439 "LeiZar"
This brand new yacht is simply beautiful and reflects all the superior design qualities for which Jeanneau are renowned. LeiZar has 3 double cabins, 2 bathrooms and a spacious well equipped galley with plenty of bench and storage space. The Jeanneau 439 features dynamic lines, a hard chine on the hull, lots of hatches and windows and beveled edges on the deck. These form a powerful and straight-forward design from the pen of Philippe Briand. But beauty is more than skin deep. A closer look reveals an innovative deck plan that makes sailing easy. LeiZar is a fast, seaworthy sailboat with simple to use deck and sail plans and a high quality interior.